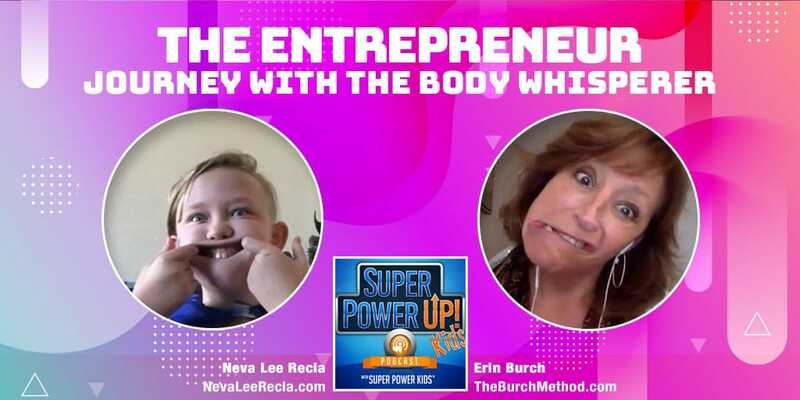 Erin Burch, The Body Whisperer, joins Neva Lee Recla to share her insight about the entrepreneurial journey. Erin is a yoga teacher, physical therapist, and yoga therapist. She helps clients connect to their bodies. Listen in now to learn all about the entrepreneur journey from the experience and perspective of The Body Whisperer. Hi Kids! This is your Super Power Kid Neva Lee Recla and today we have an amazing interview. We are talking about the entrepreneurial journey with The Body Whisperer. In the entrepreneur journey, it can mean so many different things. But a few examples are, it can mean you’re just going on the path of entrepreneurship or you’re just discovering what really matters to you. And to talk with us today is Erin Burch. She is a pioneer in the field of health and wellness. She’s a physical therapist, yoga teacher, a yoga therapist, and is known as The Body Whisperer. So without further ado, help me welcome our amazing guest, Erin Burch. Hi Erin. How are you? Hi Neva. What a pleasure to be here. I’m so excited. I met Neva probably, I dunno, eight months ago or so. Does that sound about right? Yeah, at the New Media Summit and I was like, she’s someone to watch. Well, thank you for coming on my show and then super excited. My superpowers are that I can feel into people’s bodies where they have pain and pain patterns because pain just doesn’t happen on its own. My superpowers? My superpowers are that I can feel into people’s bodies where they have pain and pain patterns because pain just doesn’t happen on its own. Pain has something behind the curtain. And so I’m going behind the curtain and going, what have we here and then unraveling it so people don’t have pain anymore. That’s one of them. Another one is I can look at people and how they’re moving and sort of see how they’re going to be as an old person. Right? So how they’re already creating this. And that might sound like I’m not talking about kids, but I actually am talking about kids too. Yeah. That’s cool. Those are good superpowers to have to be able to feel in the energies of the situations some times. I like that. Yeah. And so I’ve worked with kids and we think that aging happens when you’re old. Of course, that’s what everybody thinks, right? But it turns out that we establish patterns early in our lives and if those patterns don’t get addressed and shifted, then those will determine our aging. Yeah, that’s true. I definitely agree with that. So how long have you been helping people and helping them signs how they can heal themselves? Well, I’ve been working with people in their bodies per 40 years so I’ve been a physical therapist for 40 years, almost. That’s true because it’s like you also feel inside and you know this isn’t resonating with my body. Exactly. That’s if you’re paying attention. Right. In our culture, we sort of think, “I don’t have to pay attention to my body,” but we really do because if we want it to feel good and if we want it to last, and of course we didn’t come with a manual, which is a little uncomfortable and awkward, and so we try to figure it out. But in the process that I went through, I learned a lot of things from the inside out. So I know a lot about bodies and how to fix them. Yeah, that’s really cool. And like we said, it’s like if you have to pay attention to, it’s kinda like eating, like if something tastes really good, you want to keep getting it, but then you have to listen and say, I can’t any more. So it’s kinda like that. Yeah, making healthier choices, right. Not just eating.. Because a lot it’s interesting. Our bodies are really, really wise and when they get off track, because we don’t, our meter isn’t as sharp. So if you eat a lot of sugar, for example, your taste for healthy food goes away. You have to listen to what your mouth wants versus what your entire body needs. And also you have to listen to what your mouth wants versus what your entire body needs. So what’s your favorite part about helping people and just making sure they’re in their highest frequency as well as yourself? Awesome question. So what really lights me up, Neva, is when I teach somebody about their body and they get it right. I can see the lights go on because when people are abound their body, I say that they’re either in the driver’s seat or in the trunk, and those are two really different experiences because in the trunk you don’t have, you can’t tell where you’re going and it’s dark and you don’t have any control over where you’re going and you’re not sure where you’re ending up and you’re not sure how you got there. But when you’re in the driver’s seat, you’ve got all of it, you can take charge, you’ve feedback. You’re like in a place where you’re interactive with your world. And you can learn how to drive really well. Yeah, I agree because it’s like when you are in the trunk you’re letting other people control what you are doing. Yes. Exactly. It’s your body, right? Totally. It’s like if you’re drawing, you’re a piece of paper. Imagine the paper is your body and you get to draw whatever you want, but if somebody else goes in, scribble all over, what you do, it messes up. Like is in resonance with you. Exactly. And there’s really a place for other resources, other people, other approaches, other helpful things. Like I say use that, but don’t make them the driver. Yeah, exactly. Also try not to put other people in the trunk. Totally. You want to empower them. You don’t want to make them feel like you’re taking control, but it’s because it’s hard sometimes to be able to feel like you’re in control yet you’re not taking somebody else’s power away. Give a man a fish or teach him how to fish. Exactly. And that’s what you just described is what I do because I want people in the driver’s seat of their own body. Right. That’s when I teach and teach them because for so many years I would be the doer. Right? But it’s like that proverb give a man a fish or teach him how to fish. It’s that like when the design of your body and you’re in the driver’s seat and yes, make use of me as a resource, as a guide. But don’t give me your wheel like I don’t want it. Yeah. Exactly. You also don’t want to pawn your stuff off to other people, it’s really important to hold your grounds and also it’s going to take away other people’s and don’t let them take yours. Sounds like a lot about this. You’re pretty wise. Thank you. So I think we have room for one other question. How did you get the name in The Body Whisperer? That’s a great question. I had it given to me from one of my clients. Because I kept asking my clients, “I knew that what I was doing was really different” and I kept asking them, “how would you describe this? How would you describe this? How would you describe this?” And they could give me an answer. Finally, one of them said “you know what? I know what to call you.” She said, “You’re the body whisperer.” And I was like, “Yes.” Because like the dog whisperer like they’re effective at what they do. They have an intimacy with what they’re working with. The dog whisperer just knows. He just knows. He’s not guessing. He just knows. And that’s how I feel when I work with people’s bodies is I just know. That’s awesome. So we actually have to take a quick break, but really fast. Where can people go to find out more about you? They can go to theburchmethod.com. That’s my website and I would love to have conversations with people as a place there where you can sign up for a free consultation with me over the phone and I would love to talk to people about their issues and their questions about their bodies. Well, that’s awesome. Definitely go check her out because she is amazing. So we’ll be right back.